When you are daydreaming of a wonderfully lavish trip to Paris, it may feel painfully intangible at times. When I dream of Paris, never do I think about the romanticism lingering in the air, the beautifully cut throat high fashion, or people with berets calmly smoking cigarettes with a mysterious gaze. No way man! I dream of piping hot, garlicky and tender escargot, various foods fried in pure duck fat, extravagant foie gras terrines and simply complex pairings of wine and cheese. Oh gosh… Paris! Est-ce que vous connaissez un bon restaurant par ici? English translation: Do you know a good restaurant around here? There’s something special about Marliave. You feel like you’ve been transported to a chic and casual bistro in France where dining without a glass of wine between your fingertips almost feels uncomfortable. 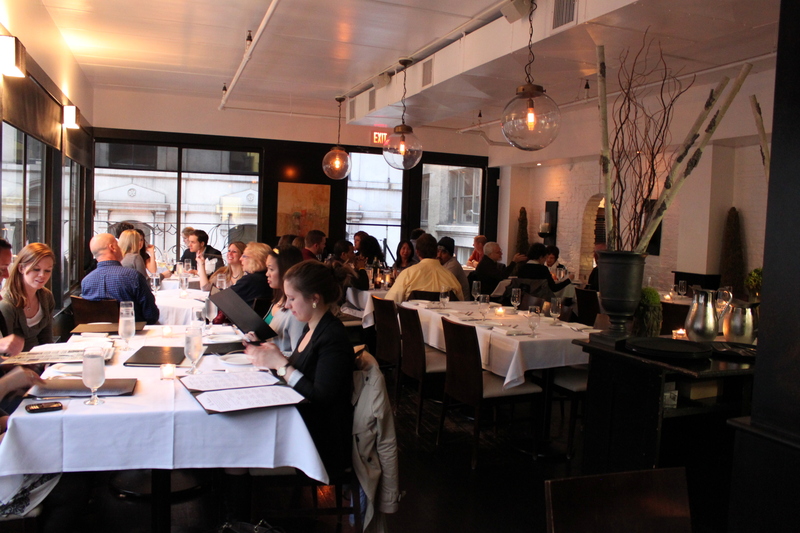 Tastefully simple, dimly lit lights heighten the ambiance for romantic dinners and gatherings of close friends. As for the food… Well, let me tell you about the food. 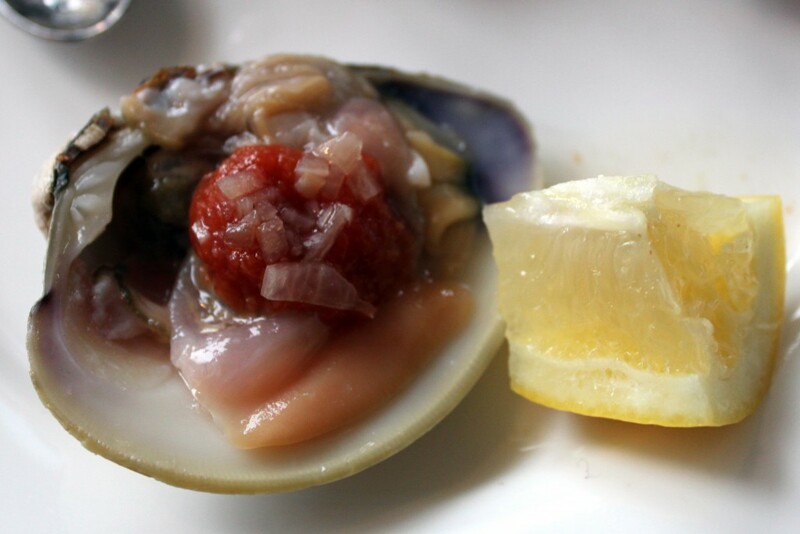 Everyday, from 4-6pm and 9-11pm, Marliave has a variety of $1 oysters and Little Neck Clams. 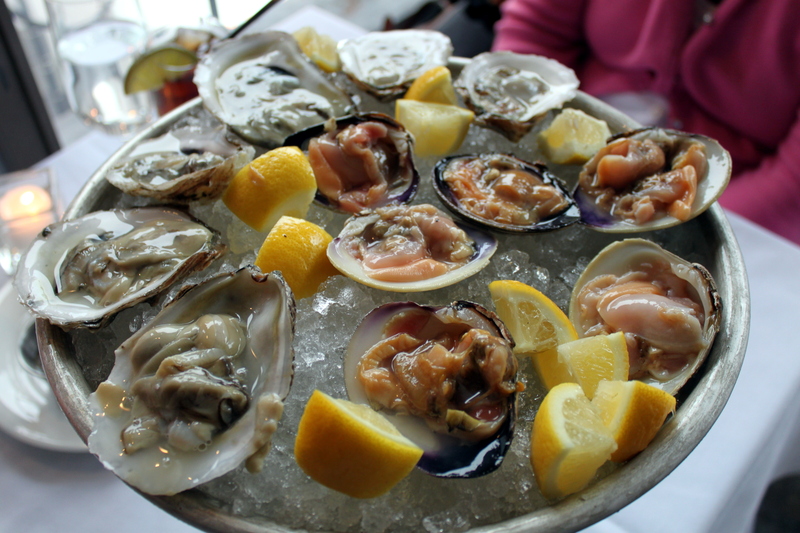 Oysters usually include Wellfleet, Peter’s Point, Duxbury and Rocky Nook. How can you beat that? 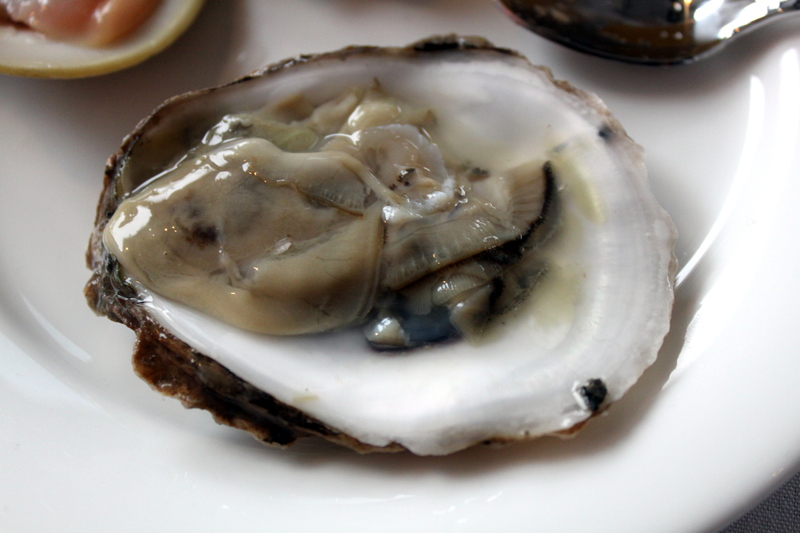 Restaurants that serve $1 oysters once a week usually serve you the ones that are about to rot. Trust me, you can taste the difference. 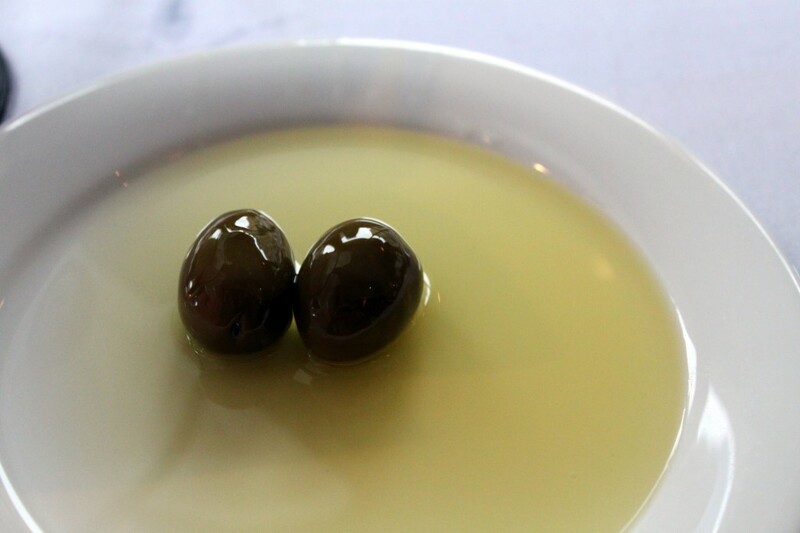 This is the perfect after-work spot to relax and slurp on some perfectly briny bites. 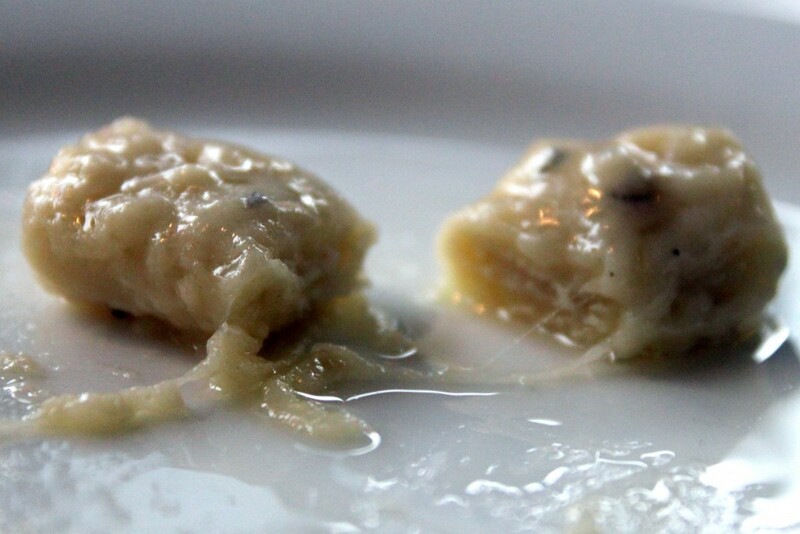 Squeeze a little lemon juice to bring that baby alive, plop a small dollop of zesty cocktail sauce and then drizzle a little mignonette on it. Yum! Instead of ordering entrees, my table split three appetizers. 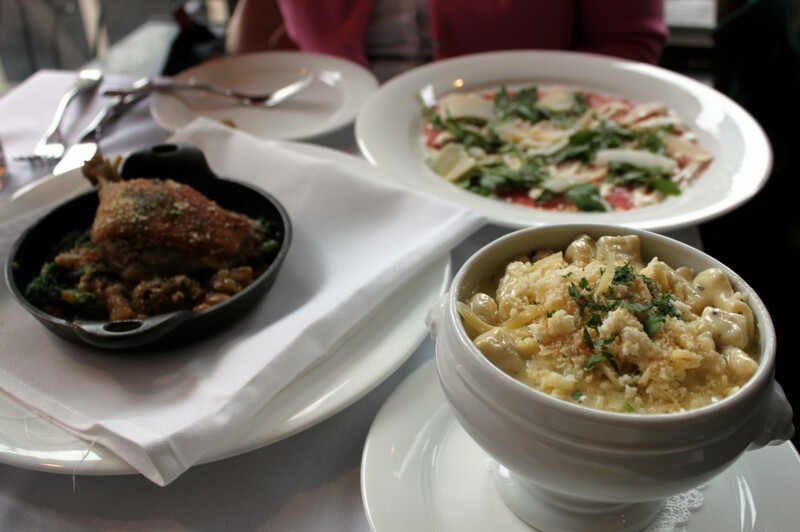 One of these appetizers is my absolute favorite macaroni and cheese. No fancy descriptions are necessary, I’ll just share the main ingredients: house cut ziti, black truffle cream and farmhouse cheeses. If you had each of those ingredients alone, they would already be good! Firstly, I don’t know how they make the pasta but the texture is unlike any other typical pastas you’ve had. 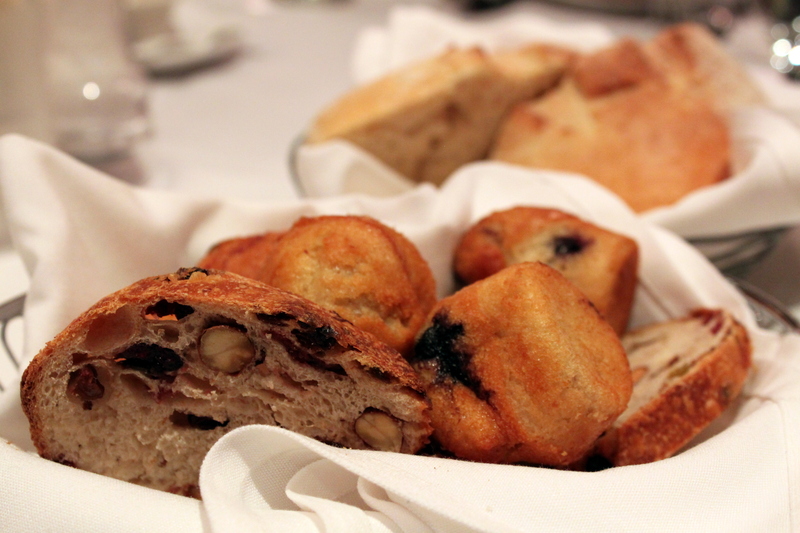 It is very chewy, but starchy and soft at the same time. 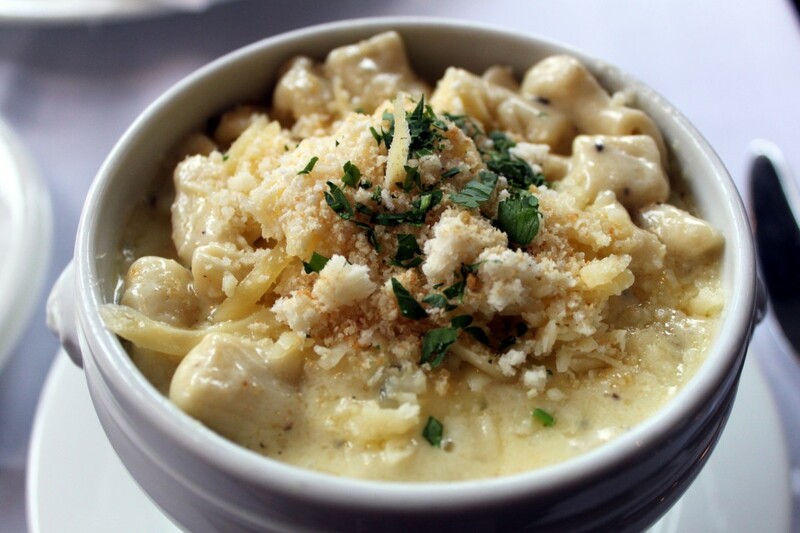 It is almost like gnocchi made al dente- except it comes with a decadent truffle cheese sauce and tells you to never stop eating it. This is a must-try at Marliave. I’ve never had anything like it! 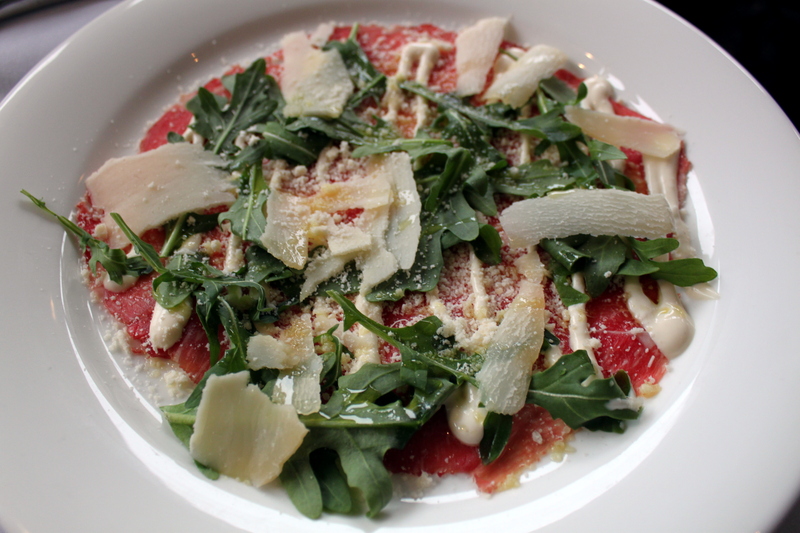 Looking at these pictures make me reminisce while salivating over the beef carpaccio. It was good. Damn good. It was prepared with thinly sliced ribeye, topped with peppery arugula, nutty Reggiano cheese, garlicky aioli, sea salt and fruity and flavorful extra olive oil. 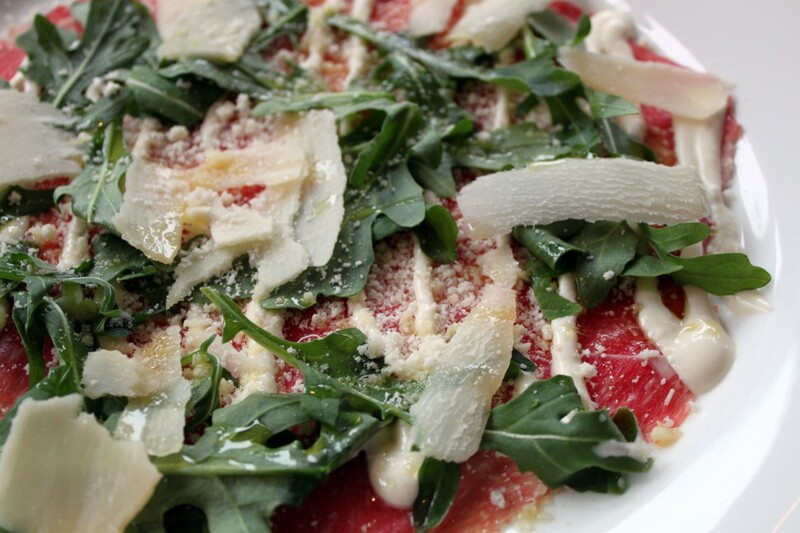 Here’s the thing… maybe you’ve had steak carpaccios before and they all have same, exact ingredients, but a good quality carpaccio goes a long way. At Marliave, you won’t have to feel unsure about ordering this dish or not. If you aren’t afraid to eat raw meat, this is something I highly recommend. 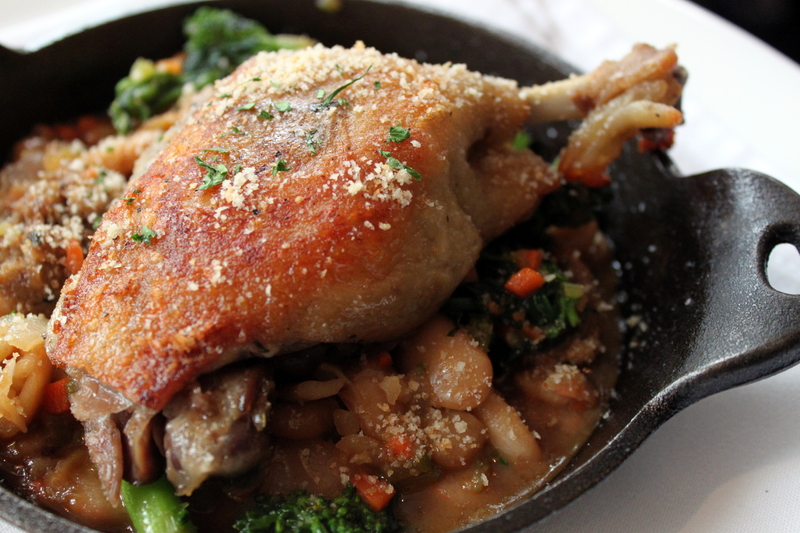 Last was the duck confit; “crispy leg, coarsely ground duck sausage, broccoli rabe, cassoulet of white beans.” It was warm, hearty, savory and delicious. The duck meat was cooked to juicy and succulent perfection, and the skin gave it a nice crispy crunch. It was a wonderful dish due to the lovely variety of textures and flavorful components in this hot cast iron dish. Of course, these are only a handful of great dishes you can order at this cozy establishment. 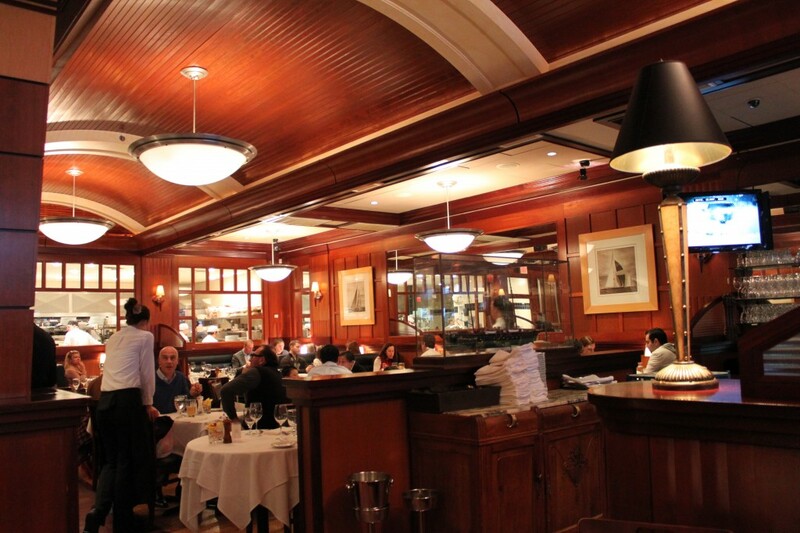 I recommend the Beef Wellington and escargot. I’ve also seen many patrons order the risotto- wild mushroom, Reggiano and truffle butter, and Henry’s Soup- french onion, Gruyere, short ribs and crouton. (Hint: Boston Restaurant week is here and the Beef Wellington is usually $32, so now’s a good time to go!) Cheeses and charcuterie are a good option as well. The Fish-n-Chips has been the only dish I felt indifferent about. I’m not sure if it was only that one time, but the fried batter and french fries were a bit soggy and oily. 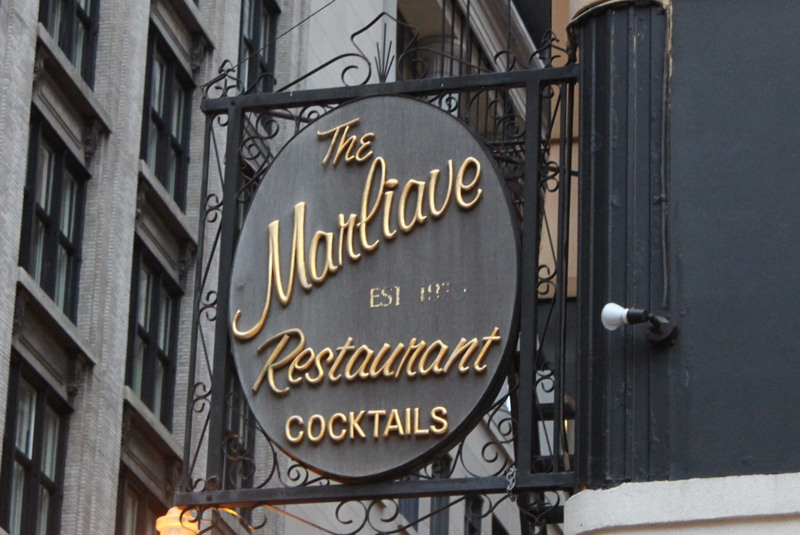 Even though there’s one single dish I didn’t thoroughly love here, it never alters my wonderful impression of Marliave. 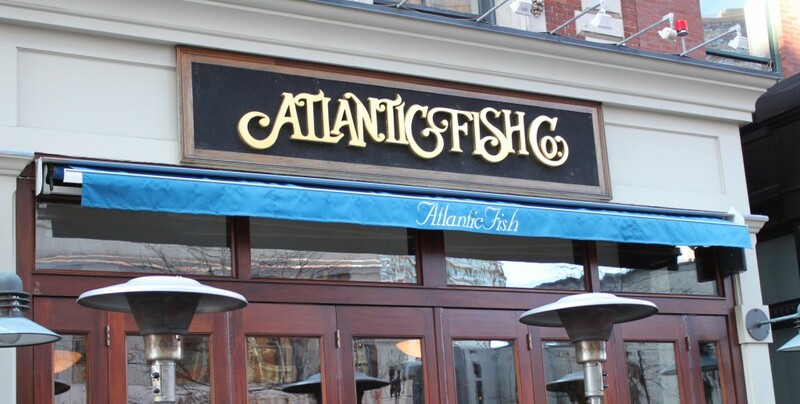 Walking into Atlantic Fish Company was like walking into a grand, elegant ship with its lustrously polished wood and rounded high ceilings that look like the base of a large vessel. It was a special place for a special day. My sister took the family out for a lovely lunch for our father’s birthday. We’re so lucky… she always spoils us. The decor couldn’t have been more fitting with the cuisine. The menu proudly boasts incredibly fresh seafood dishes; plump and juicy scallops, sweet, flavorful shrimp and delicate crab meat risotto, and daily specials like the Chilean Sea Bass. It was a polished place for polished meals. 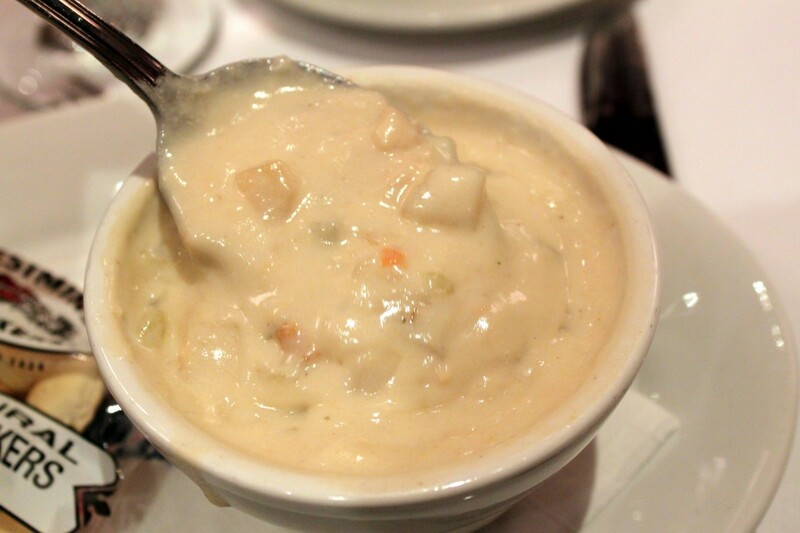 For starters, we had the award winning clam chowder. 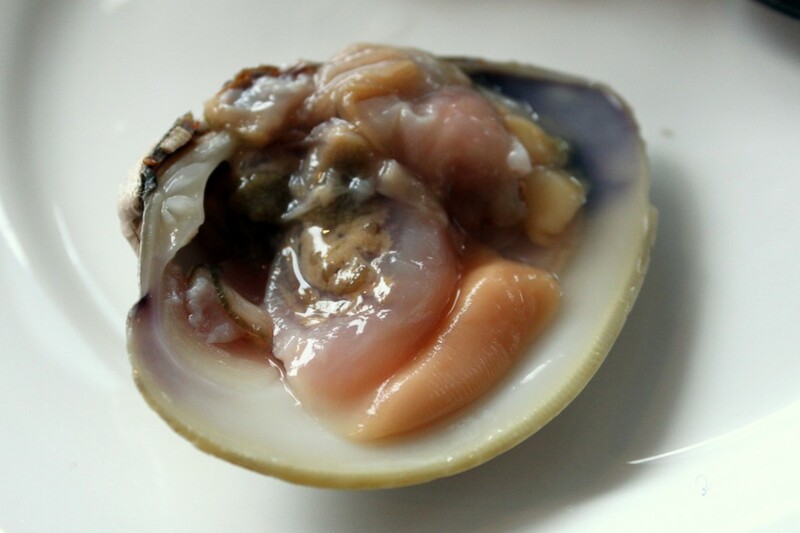 I’m sure it received an award for its thick and creamy consistency full of clam flavor with a subtle spicy kick at the end. The cup of soup was flawless. For $5, this is a keeper. For $7, this is a keeper with a bread bowl. Yum. If one restaurant’s chowda was to represent Beantown, this would be it. 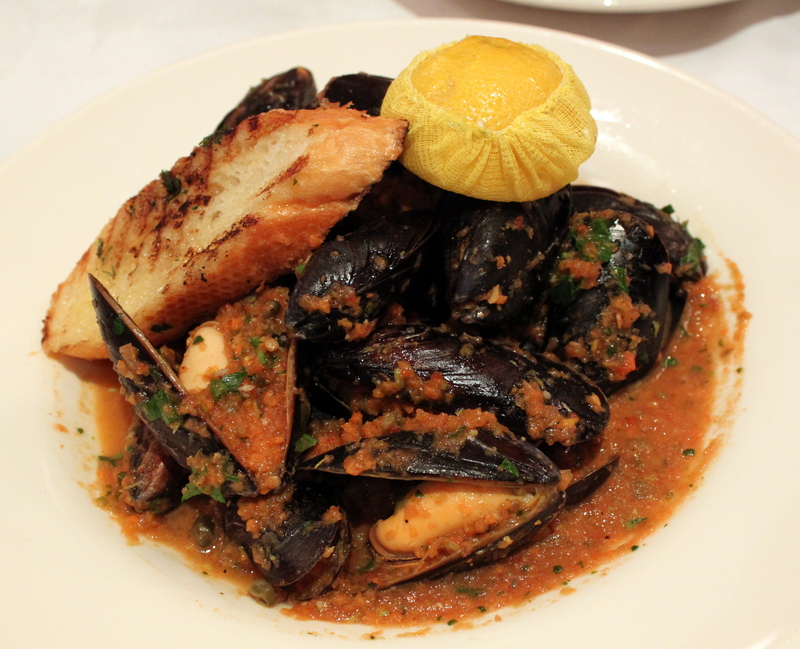 As for the mussels, they were nicely plump and meaty. Surprisingly, the large amount of sofrito did not overwhelm the dish at all. 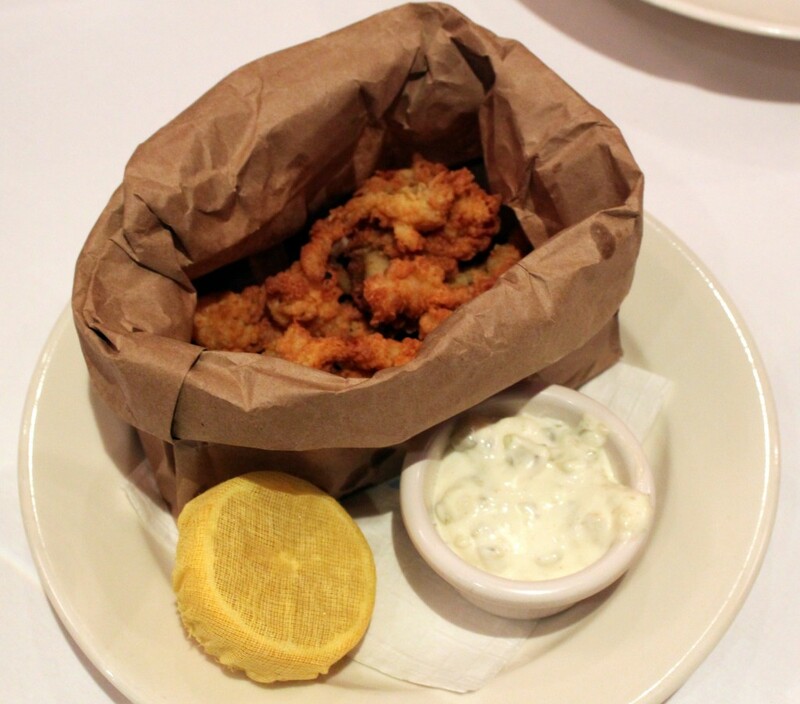 Lastly for apps, the fried clams were good as well, but $16 for a small brown bag of clams hurts- even if it is a fine dining restaurant. Everything was cooked to perfection. Our waiter suggested that the Chilean Sea Bass be pan seared. Good call. The sear on the filet had great color, texture and provided a wonderfully crispy contrast to the tender and moist flaky meat inside. 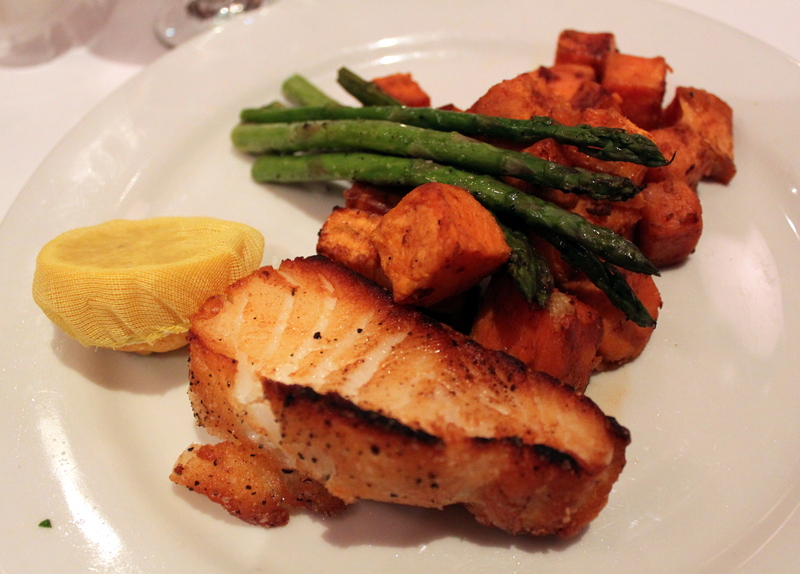 Although it was a petite piece of fish, the plate as a whole left you feeling satisfied. 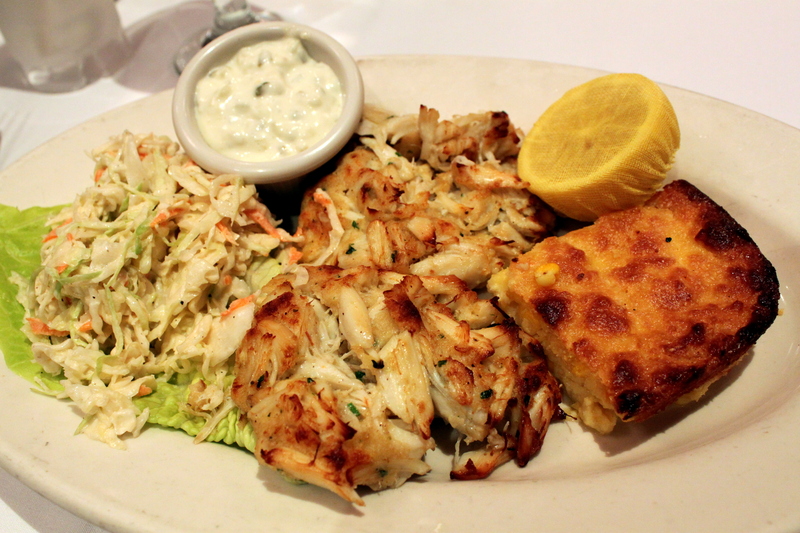 On the other hand, the Jumbo Lump Crab Cakes were massive. They were generous with the amount of crab meat where the cakes practically fell apart when set on the table. Served with coleslaw and delicious corn pudding, this was a dish I would order again. I really appreciate how Atlantic Fish Company doesn’t overdo their crab cakes with bread crumbs and seasoning like most restaurants. It was au naturel seafood at its best. Another highlight of the dish was the corn pudding. It was like a pan seared sweet custard with crunchy little kernels that popped when you bit in. This was a refreshing and creative side dish aside from traditional mashed potatoes and rice pilaf. 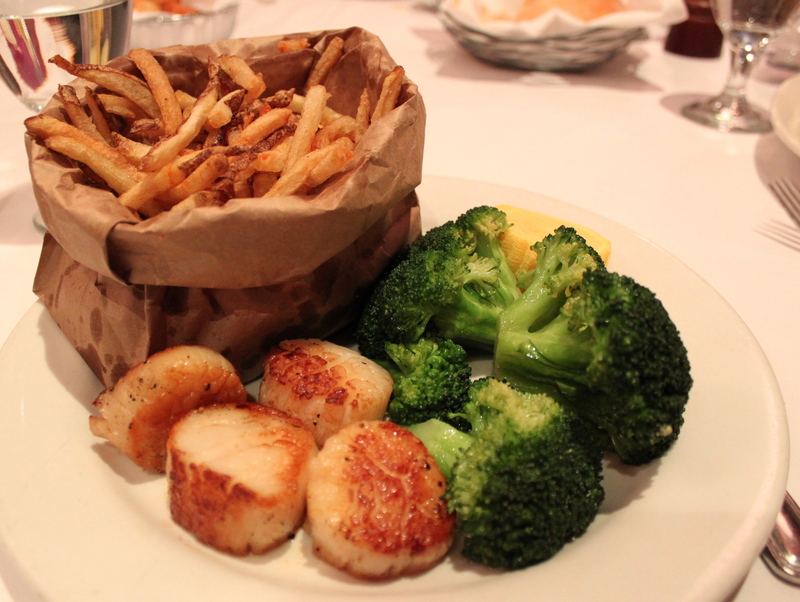 And lastly, the scallops. I did not try it, but I was told it was a bit under-seasoned but cooked just as perfect as the other dishes. All of the entrees could’ve used more salt and pepper, but the issue was minor because everyone at the table thoroughly enjoyed their meal. As I mentioned in before, the service was friendly, inviting and most importantly, they made my dad’s birthday special. At the end of the lunch, they surprised our table with three complimentary desserts on a tray with “Happy Birthday” in chocolate syrup. 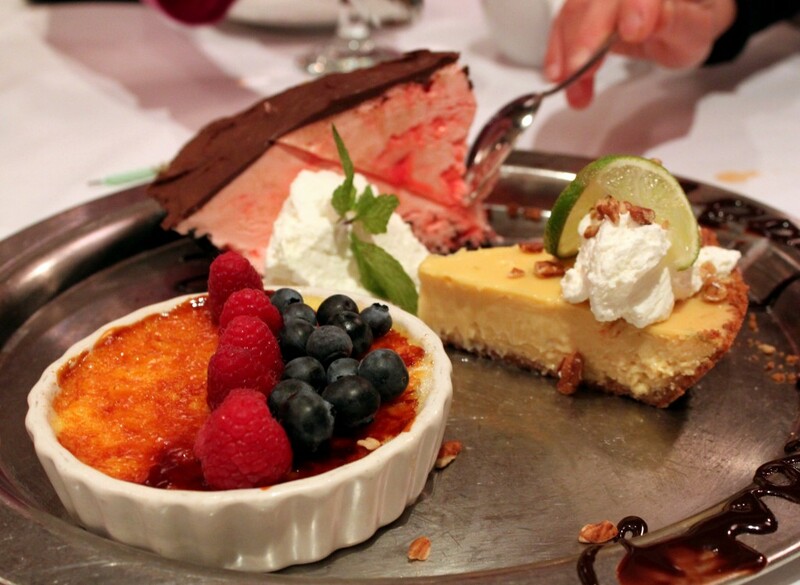 There was creme brulee, key lime pie, and peppermint ice cream pie- all with a candle on top. Now that’s good service! 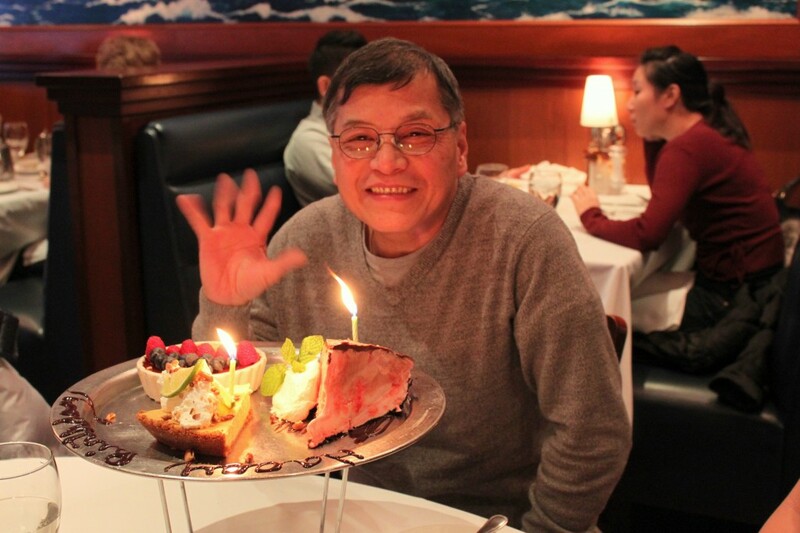 Thanks for the lovely lunch, Lily, and I hope you had a very happy birthday, Dad! And thank you too, Atlantic Fish Company!